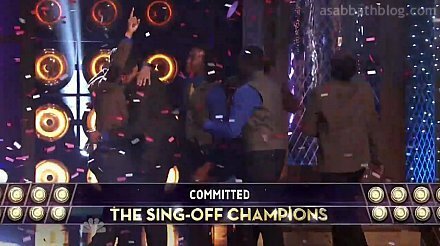 Committed is the new champion of "The Sing-Off," winning the grandprize: $100,000 and a Sony Music recording contract. They were announced the winners during the show's live season finale on Dec. 20. 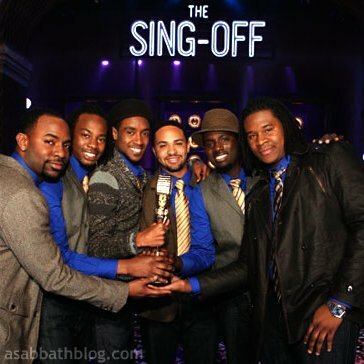 They are the second Seventh-day Adventist a cappella group in a row to win "The Sing-Off." Nota won the first season of "The Sing-Off" in December 2009. During the finale, Committed performed with celebrity music artists Boyz II Men, Neil Diamond and Nick Lachey. Committed sang "Hold My Hand," which left judge Nicole Scherzinger in tears. The show ended with Committed singing an arrangement of "We Are The Champions." Watch every performance by Committed on "The Sing-Off." Committed was up against nine other groups at the start of series. Four groups remained at the start of the final show. Street Corner Symphony came in 2nd place; The Backbeats came in 3rd; Jerry Lawson and Talk of the Town came in 4th place. "Please pray for Maurice because he's sick on the day before the live show! Pray for a miracle! Already claiming his healing in Jesus' name!" Whether Maurice Staple felt better or not, he performed with the rest of his group during the finale. According to The Huntsville Times, Cedric Dent of Take 6 recommended Committed when NBC was putting together groups that would compete on the show. Committed had sang at an event celebrating Take 6, a 10-time Grammy award winning a cappella group that also traces its history back to Oakwood College (now Oakwood University). The a cappella group was formed in 2003 at Forest Lake Academy in Orlando, Fla. Since then, the group's membership has changed lots of times. The current group is made up of five graduates and one undergraduate student from Oakwood University in Huntsville, Ala. They are Dennis "DJ" Baptiste, Jr., Alain "Tommy" Gervais, Geston Pierre, Robert "Robbie" Pressley Jr., Maurice Staple and Theron "Therry" Thomas. Twitter users gave an early indication as to who would win the competition. A Sabbath Blog ran a search of all tweets posted within an hour before the finale's airing time that either had the words "sing off" or "sing-off" and named their favorite group. 74.6 percent of tweets were in favor of Committed. 17.0 percent were in favor of Street Corner Symphony. 5.0 percent were in favor of The Backbeats. 3.4 percent were in favor of Jerry Lawson and Talk of the Town. It turned out to be in the same order as the actual show's results. Won the Sing Off title! God is so good. They didn't waste time getting us to work though! Access Hollywood Live this morning, E! News later today, and recording tonight in the studio. What is happening?! Lol!! Surreal = Understatement. They will also be singing on The Today Show in New York City, according to a tweet by Tommy Gervais. Read more articles about Committed. "The Sing-Off" judge Shawn Stockman shares why Committed won and some advice for Committed. I was really impressed by their singing. I also was very excited to see a Christian group being nationally recognized. Unfortunately I became increasingly disappointed by this group because of their “sexing up” of their performances. A good example of this was during their Usher medley. They were singing about making love and touching themselves! Pitiful! The judges even commented on this. Nicole Sherzinger even blazingly commented “that was the Holy Spirit moving through them” (concerning their sexual movements). Again, they were amazing vocalists, but what kind of Christian testimony is this sending to the world? Sad. I totally agree with Todd. Committed is not a representation of what the SDA stands for. We have to stand out from the world and let our youth know that we can stand up for God in the world without taking on the behavior of the world. This is sad for the SDA church (especially the Usher song) and it is also sad to see our youth in the SDA church justifying why this type of behavior is ok because they won. We have to hold up a standard of righteousness, which is, I presume, is the reason why they could not use the SDA name on the show. This is sad. I pray that our youth will stand up for righteousness and know that this world is temporary and heaven is our home and our ultimate home. While I certainly do not condone "taking on the world's behavior" as it was mentioned above, I think we as fellowmen of the faith should take a step back and take another look at their situation. These are 6 young men who have just suddenly recieved a tremendous amount of recognition that probably has also come with an overwhelming amount of pressure that many of us on the outside looking in cannot identify with. They are at the beginning of their careers where it is very possible for them to succumb to such influences that even they, themselves may regret afterwards. Therefore at this infant period of what could be powerful witness on a much bigger stage, it is not a time where they should be shunned and rejected by their own but rather prayed earnestly for, encouraged, supported and yes even at times lovingly rebuked. I believe that any believer who geniuinely wants to see the advancement of God's kingdom would take a stance that would not only be intercessory for the souls of the members of Committed but also the many individuals in the music industry that God IS able to use them to reach.